mindsensors.com released a new version of the acceleration sensor (ACCL-Nx-v2). It is a new multi-range acceleration sensor for the NXT. Features a three axis sensor which operates at 4 programmable ranges of 2.5G, 3.3G, 6.7G and 10.0G. This new and versatile sensor replaces several previous mindsensors.com similar products, with 2 or 3 axis reading capability which operated at a fixed acceleration range each one (ACCL-Nx-2g2x, ACCL-Nx-3g3x and ACCL-Nx-5g2x). 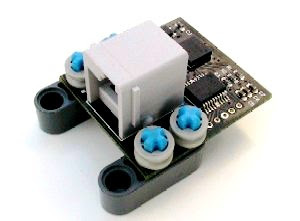 "Multi-Sensitivity Acceleration Sensor (ACCL-Nx-v2) is a 3 axis digital acceleration sensor designed for Lego mindstorms NXT. This sensor works at 4 different sensitivity levels of gravitiy. The sensitivity can be chosen in your program. This sensor can be used to measure static and dynamic acceleration in different axes. You can use this on your robot as tilt sensor or to track the velocity profile." Uses NXT compatible I2C protocol for communications. Supports Auto Detecting Parallel Architecture (ADPA) for sensors. This means that ACCL-Nx-v2 can co-exist with LEGO or third party digital sensor on the same NXT port. This enables you to employ several sensors on the same port without the need of external sensor multiplexer, reducing the overall size. More information about this sensor, can be found here.